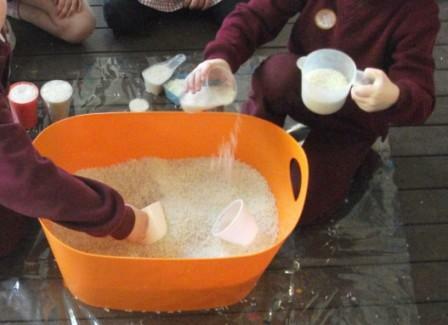 It’s the start of the new term and the children are brimming with ideas for play. 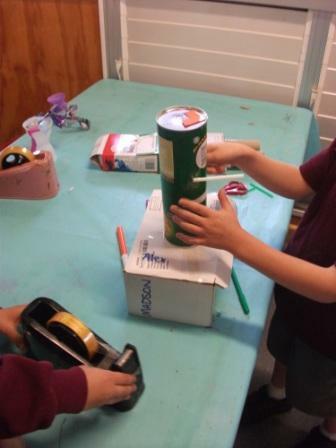 Yesterday had seen the construction of a kindergarten for the dolls and lots of space ships being created at the collage table. Today they were children on a mission. 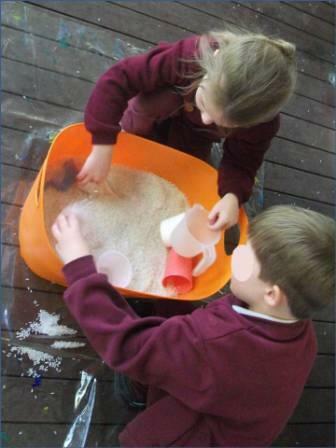 They knew what they wanted to do next and after discussing their ideas at Planning Play Time they set to work. 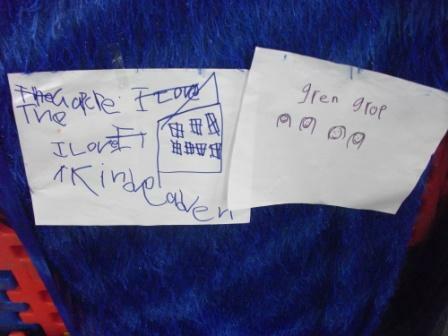 Some of the children decided they needed to make some signs for the kindergarten “so people would know all about it”. 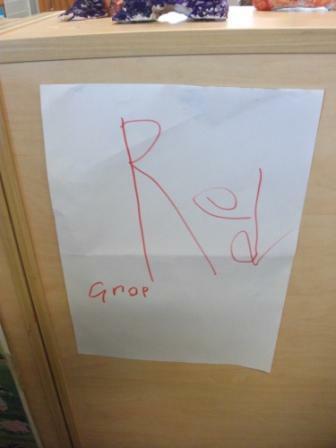 The teachers in the kindergarten’s 2 classrooms said they needed signs so people knew which classroom was which. 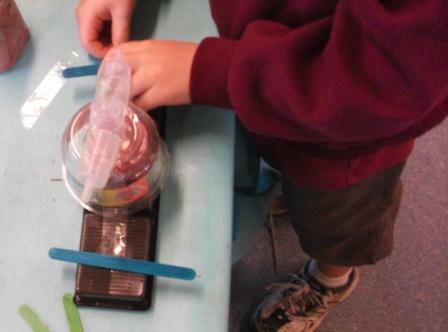 Lots of writing ensued…. 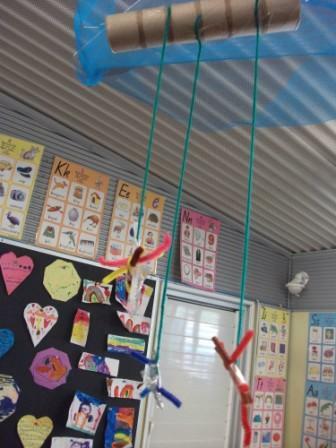 The Gap has a new kindergarten and it has very new things to do and you will like the kindergarten. They will like it very much. They will want to play. 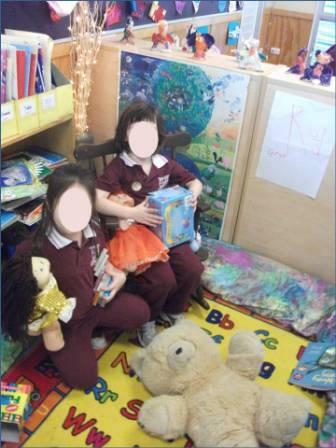 In the red group classroom the “teachers” read the dolls a story. 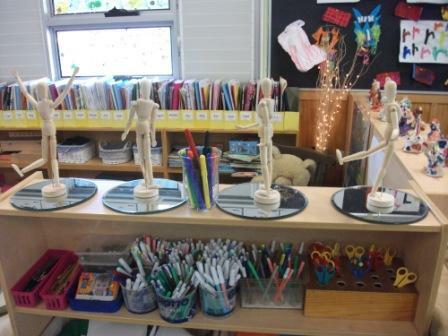 It takes a long time to get the dolls ready to go to the new kindergarten. 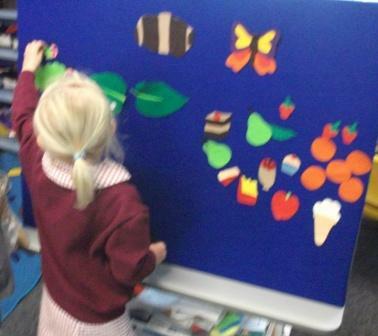 Some of the “teachers” practiced telling stories on the new felt board. 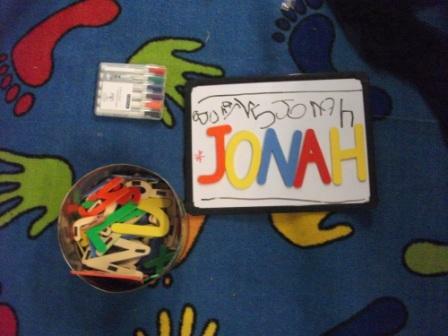 Another “teacher” helped them with the magnetic letters and whiteboards. 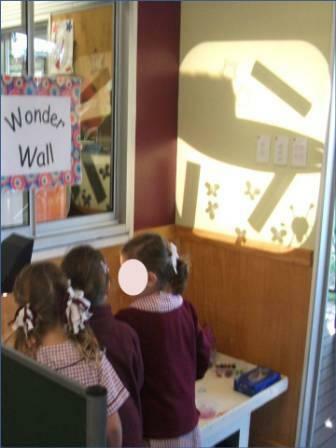 The back of the kindergarten. 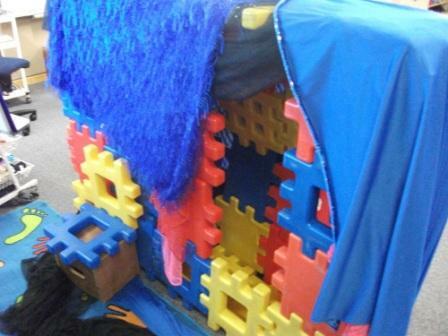 The inside room is very small. 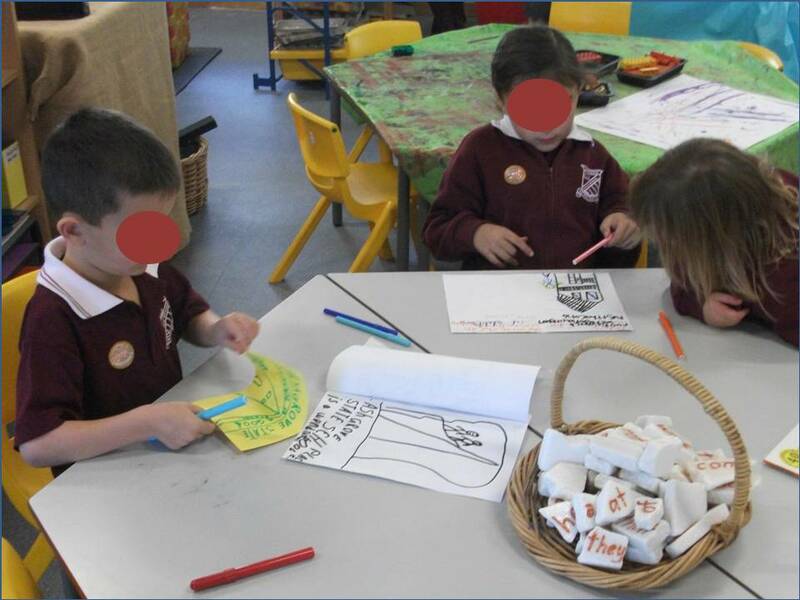 Over at the collage table, spaceship construction was again well under way with lots of discussion about what they really look like and 0ne of the children said “lets google it”. 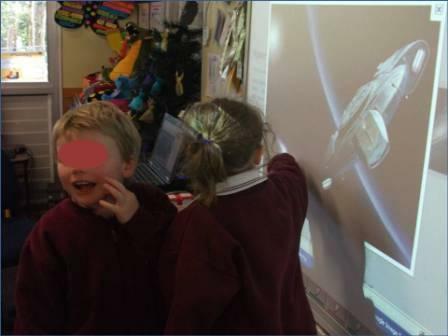 A common cry in our classroom. 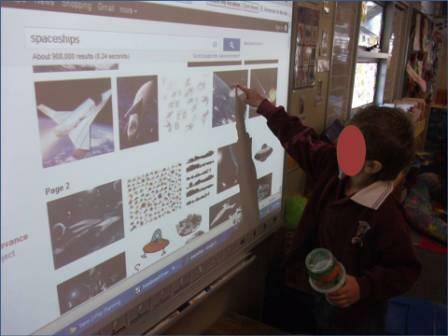 They asked me for help and after typing spaceships into Google Images for them, they continued their conversation as they looked at the images. 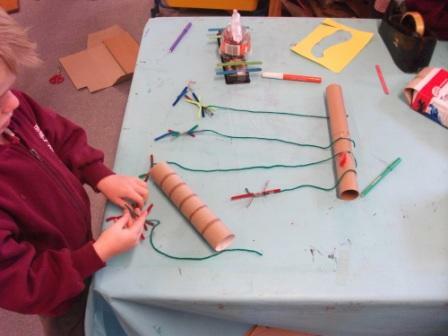 Armed with this new information they went back to the collage table and continued construction. 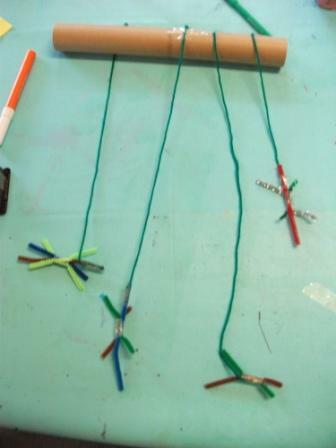 The image of a spaceship with some stars in the corner sent H. off on another tangent – making the milky way. 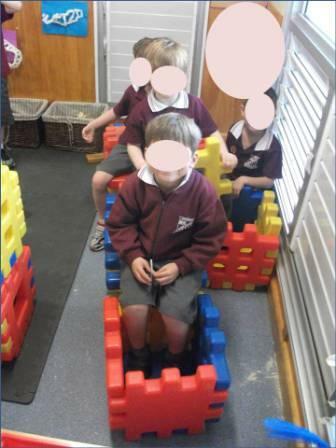 In block area there were children playing cooperatively to build a spaceship they could sit in. 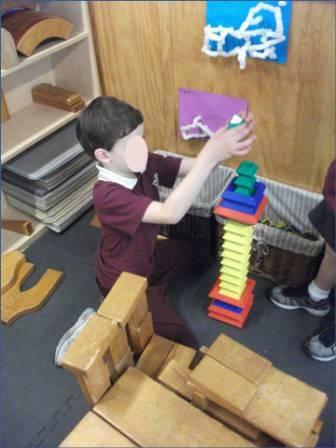 Another child was experimenting with balance whilst building his spaceship. 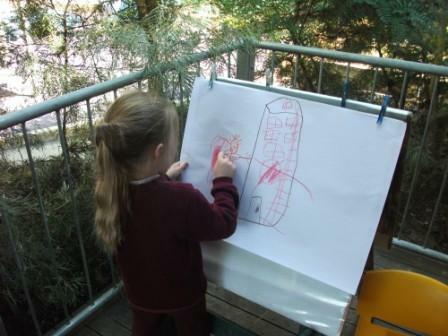 Outside on the verandah some children were very engrossed in a sensory tub of rice and drawing at the easels. 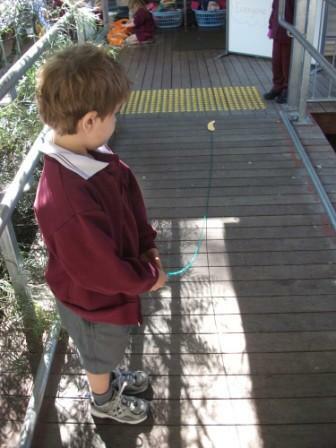 F. was also out there test flying his helicopter up and down the ramp. 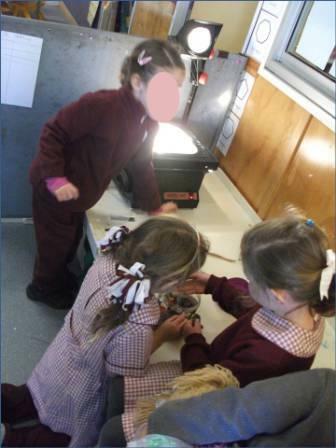 Down the back of the classroom the overhead projector was still attracting lots of interest and experimentation. 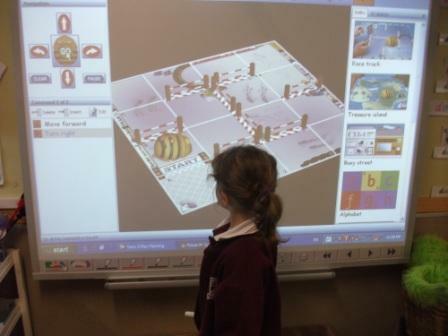 After the spaceship investigators had finished with the IWB another group of children asked to use the Beebot program. 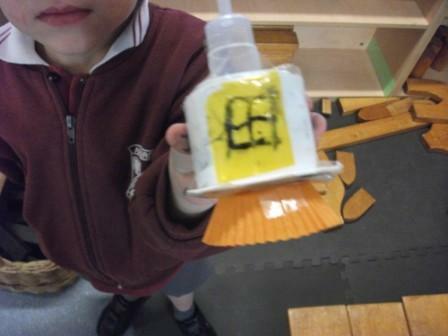 We have 2 Beebots in our classroom but the IWB program is new and the children are able to see the movement through the eyes of the Beebot. They really enjoy this new perspective. 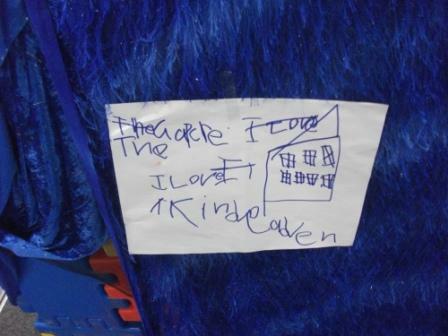 Over at the drawing and writing tables other children were busy making books for the kindergarten. 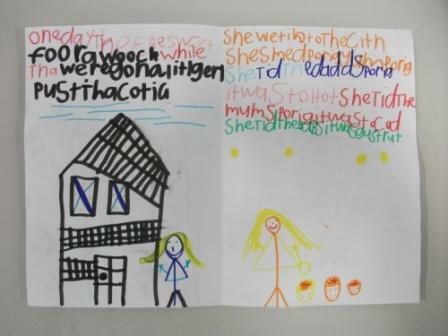 M. was writing and illustrating the story of Goldilocks and the 3 Bears, with help from another friend. 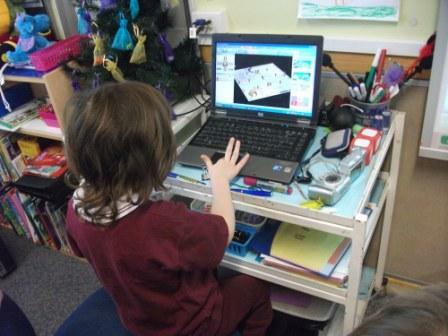 A. was making a book about school. 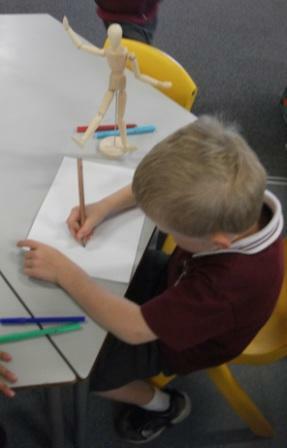 J. asked if he could draw 1 of the models on the shelf. 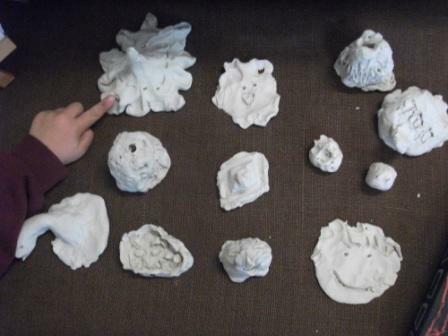 E. spent some time looking at the OHP Investigation photos and some clay creations. 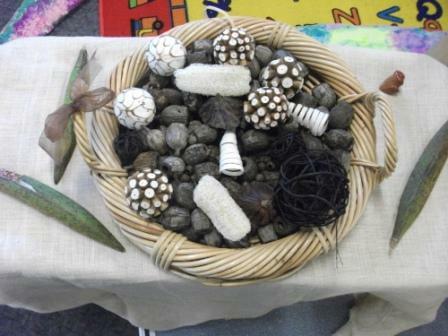 During the morning tea break, just before this play session the children found some seed pods. 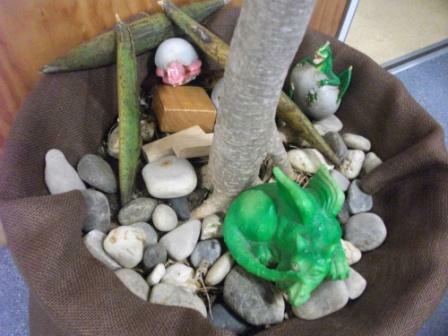 At first they put them with one of our nature collections but then decided to make houses with them for the dragons under our Chicka Chicka Boom Boom tree. 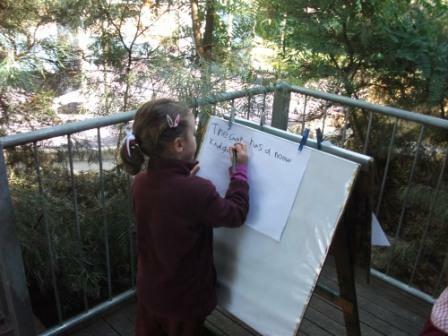 (We had also read Hunting for Dragons by Bruce Whately earlier, during the morning session.) Perhaps a house would make the dragons harder to find. 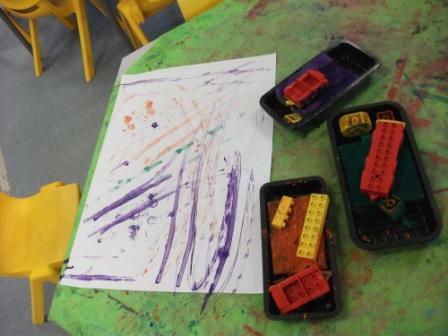 Our sound for the week is /d/ and so as well as dragons we had Duplo Printing. All of the above happened in the middle session today between 11.25am and 12.45pm. and I was the only adult in the room. At 12.45pm we had a meeting. 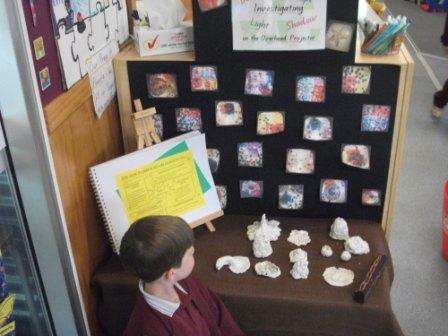 during which we shared what we had done and reflected on what could happen tomorrow. 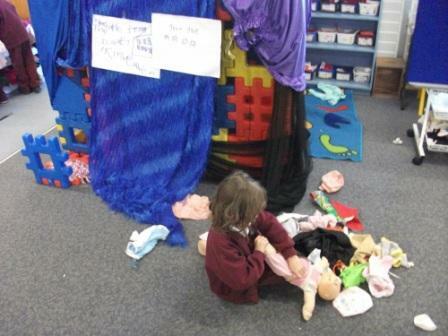 We then tidied up whatever needed tidying and played a quick game of Spot the Letter dD to transition to lunch. 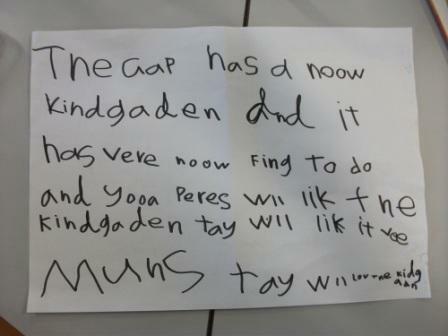 After lunch, the children went to PE and came back asking if we could do meditation. They were exhausted and so was I. 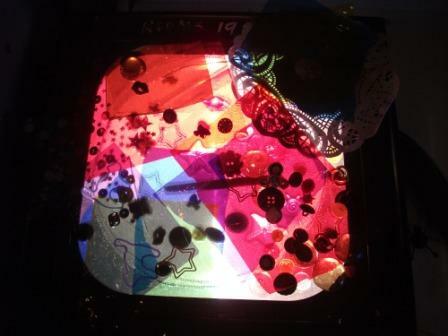 So we turned off the lights, did 2 relaxation activities and read a story. Then it was time to go home. 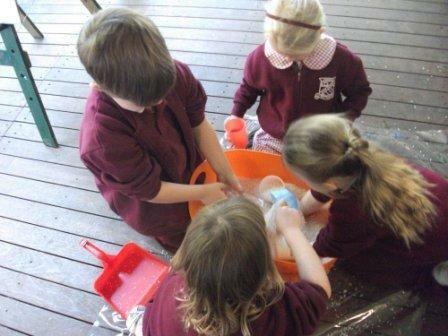 Happy and full of news to share with their family about another busy day at Prep. WOW! 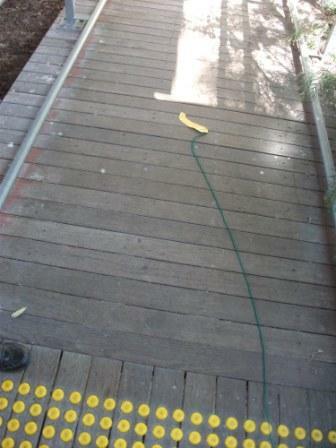 … Another busy day in prep indeed!!!! !